EDINBURGH boxer Gary Young insists he wasn’t surprised as Kevin McInytre bounced back to beat Edinburgh welterweight Gary McMillan at Meadowbank on Saturday night. British Masters champion McMillan had dumped Paisley fighter McIntyre twice on the canvas with blistering, power-packed body shots in the first round and seemed on his way to victory over his fellow Scot, who was forced to take two long counts of eight from the referee. 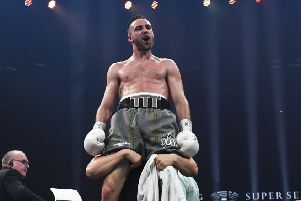 However, former British champion McIntyre stormed back to outpoint his opponent 95-94 and stun the large ringside crowd. Young, a former Gilmerton club colleague of McMillan, but who was supporting McIntrye at his ring corner, claimed: “I beat McMillan for the Scottish welterweight title a couple of years ago and I told McIntyre ‘When you fight McMillan, you don’t fight fire with fire. Even McMillan’s coach Terry McCormack conceded: “You have to hand it to McIntyre. After Gary dumped him on the deck twice in round one I thought we had the fight in the bag, but McIntyre showed why he’s a former British champion by taking the play away from Gary. Meanwhile, there was no room for any doubt about show promoter Alex Arthur’s superb fourth-round stoppage win over gutsy Georgian Aleksander Vakhtangashvili. Arthur’s crushing left hooks to the body and chin forced Vakhtangashvili to take two counts of eight before the referee stopped the bout. The writing was on the wall in the previous third round when Arthur dropped Vakhtangashvili in the Georgian’s own ring corner with his trademark vicious left hooks to the body. Capital super-middleweight Kenny Anderson was in a similar impressively destructive mood as he flattened Sheffield opponent Lee Duncan with a scything right hand to the jaw, which left the Englishman out for the full count 48 seconds into the fourth round, a massive blow that left the sorely stricken Duncan needing medical aid before being allowed to leave the ring. However, for the first three rounds, Duncan’s hit-and-run tactics looked as though Anderson might be in for a long, frustrating, night. Two other Capital boxers, lightweight Jason Hastie and middleweight John McCallum both notched up points wins on Saturday night’s undercard. Hastie never lost a round against awkward London southpaw Johny Greaves, while McCallum also won all six rounds against tough Brighton survivor Ian Jackson.